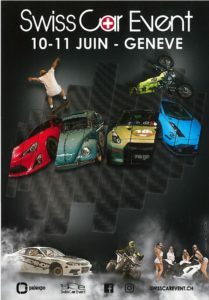 The Swiss Car Event, Switzerland’s largest indoor meeting, is celebrating its 10th birthday! For the past 10 years, the SWISS CAR EVENT has been THE annual meeting in French-speaking Switzerland. It brings together 12,000 Swiss and European fans of modified vehicles with the sole aim of exchanging and sharing their passion with fellow enthusiasts over the course of a weekend. The eleventh SWISS CAR EVENT will be held on 10 and 11 June in Palexpo. Visitors will have the chance to admire some 1,200 automobile projects spread over 55,000 m2 of exhibition space. AND, PNEUS CLAUDE is partner.